We were delighted to hear back from one of our workshop attendees about how her self-care massage was going, here’s the proof that self-care massage works! “When I was younger, right up until a ‘Love your Belly’ workshop, I had always been aware of the arrival of my periods. They had been cripplingly painful, given me headaches & had lasted 5 to 7 days. After attending a workshop with Leora & Kate, I learnt to accept & understand & this made a HUGE difference. From our first ever experience we are told our periods are a ‘curse’. THE Curse! We must not talk of them in polite company & use the ‘global’ sanitary products & specific pharmaceutical drugs to mask them. 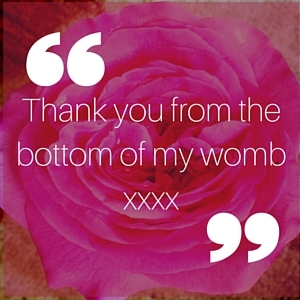 Just from one Love Your Belly workshop, I learnt that actually, I’m a woman which means I’m blessed with the miracle of having a Womb & if fortunate, the ability to carry life inside of me. It’s a big deal right? Huge. Not a curse at all. How blessed am I in fact that my healthy, functioning body has prepared itself, month after month to house LIFE, had I chosen to do so. So from the workshop I now treat myself with kindness & respect. I honour myself each month by taking time to be calm, listen to my body & be gentle with my schedule so I can live & enjoy what my body is going through rather than masking & ignoring what my body is experiencing. So I’ve gone from not even knowing what a Mooncup is to using one. I now perform, womb yoga regularly, self, tummy or womb massage & I listen to my body.